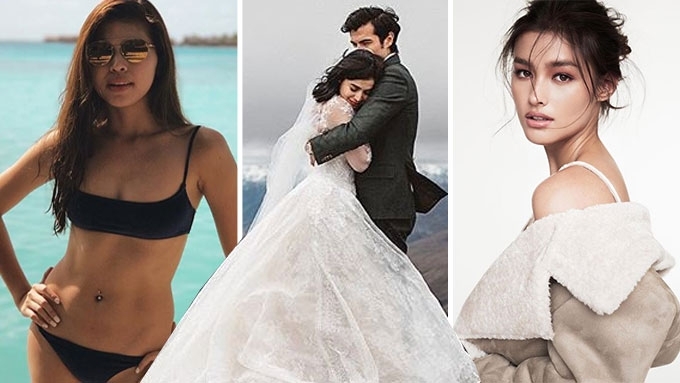 (L-R) Maine Mendoza, Anne Curtis Smith, and Liza Soberano's best moments on Instagram. Before saying goodbye to 2017, let's have a look back at the best moments of your favorite stars. Thanks to the website 2017bestnine.com, compiling nine of their most-liked moments on Instagram has become easier. It can cull the total number of posts and likes, too. Based on the data, It's Showtime host Anne Curtis Smith had the most number of likes this year. 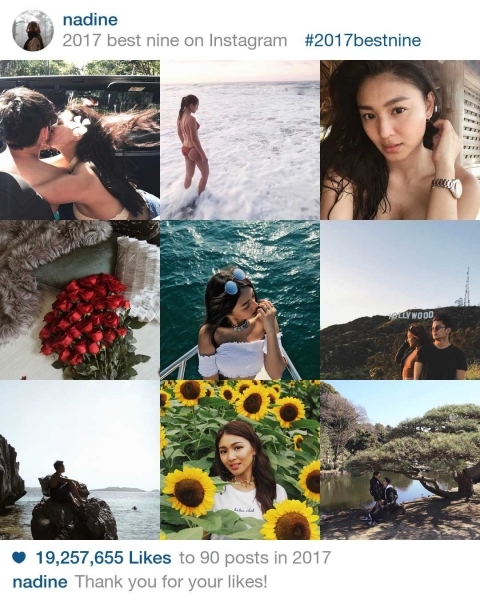 The Kapamilya star garnered more than 78.8 million likes for her 569 posts—the highlights of which were her engagement, prenup shoot, and wedding. Miss Universe 2015 Pia Wurtzbach received more than 60 million likes for her 415 posts. Pia's "best nine" included her farewell walk as Miss Universe last January, Star Magic Ball comeback, and her swimsuit shots. Bagani actress Liza Soberano generated more than 38 million likes for her 242 posts. Marian Rivera had 21.8 million likes for her posts about daughter Zia and her trips with husband Dingdong Dantes. Eat Bulaga! co-host Maine Mendoza only had 64 posts, which garnered at least 11 million likes. And what was Maine's most liked moment? Her runway photo at the Bench Under The Stars fashion show last November 18. La Luna Sangre's Kathryn Bernardo received 24 million likes for her 140 posts. Her photos with boyfriend Daniel Padilla were her followers' favorites. Unexpectedly Yours actress Julia Barretto got almost 20 million likes. Solenn Heussaff received 19.7 million likes. Gabbi Garcia also had 19.7 million likes. VIVA talent Nadine Lustre generated 19.2 million likes for her 90 uploads. My Korean Jagiya's Heart Evangelista received 16.7 million likes for her 1,026 posts. 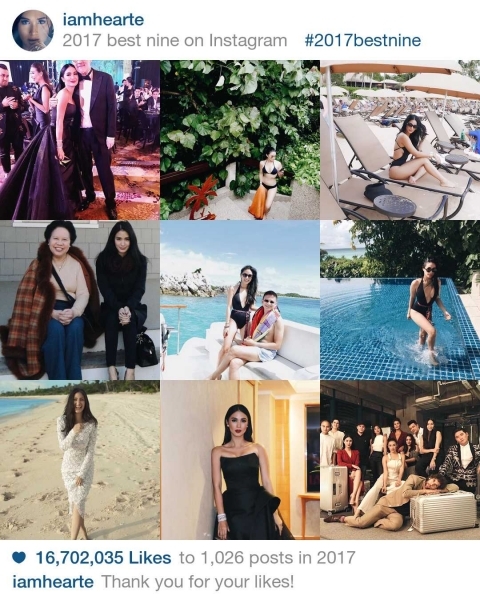 Among her most liked photo was her wefie with Star Magic's Johnny Manahan (top, left). 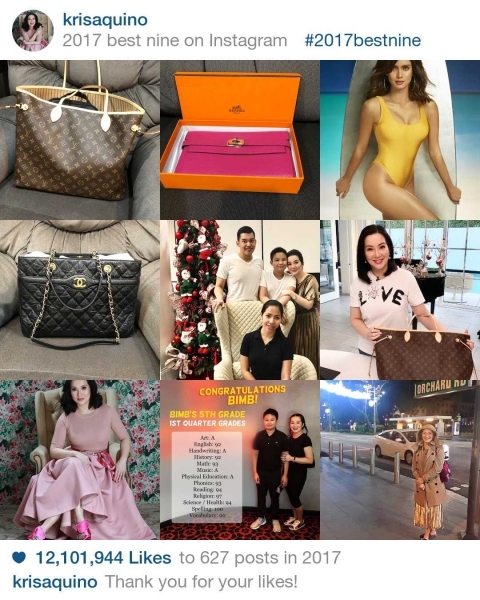 TV host/actress Kris Aquino managed to get 12 million likes for her 627 posts. Her Hermes, Louis Vuitton, and Chanel bags definitely caught the attention of her Instagram followers.